Augmented realities in learning – hype for now? I don’t have enough time for thinking these days – which is not a very good thing.This thinking beyond ourselves is what the game of learning is all about, and how we do this is how we augment the true cognitive capacities of our minds, regardless of what technology-enhanced sphere that thinking takes us into. I see so much happening in school and higher education that is encouraging – not the least being the passion that individual ‘teachers’ as learners bring to the daily interaction of augmenting the cognitive interactions of many minds. This is what makes learning special.We’ve had this extraordinary trajectory happening as lead speakers ‘bag out’ the industrial model of schooling, introducing ‘new’ ideas, tools, or learning designs. Everything in the past was NOT all bad – if it was we would still be in caves! Oh I do not dispute the need for change, but I do dispute the passion with which educators get onto the latest bandwagon. First it was the internet, then it was the ICT imperative, then it was computers, then it was laptops, then it was BYOD and mobile devices – like any of this was a curative for poor thinking, poor inspiration, poor learning. So for me today it’s the MOOC hype. While the MOOC hype continues to grow, lets not confuse mass attendance, choice, access to instructors outside our physical domains, or online platforms for informal courses as being ‘new’. Society has always had answers to the ‘informal’ learning needs of groups of people, and at times these spaces merge into more structured or formal forms of learning. Socrates challenged his listeners – so do MOOCs – if they have a ‘socrates’ equivalent to spike the thinking. But that’s not the only thing that is needed to add depth to knowledge. We have to work with the experts somewhere along the way. We have to undertake research to test ideas, look for answers, find new questions. So I see this ‘hype’ as really an extension of ways that we augment our learning capabilities.I know that ‘augmented reality’ is used to mean something different – but is it really any different? Whether the augmentation takes place purely in our minds, as we overlay one idea upon another, or whether the augmentation takes place as we overlay a tech-inspired 3G delivered bit of information/ideas on a local view of things – the question remains – what are we learning? what is it’s deep value? how will this scaffold thinking? Will I want to seek out more? To be honest, it’s going to take a long time before MOOC, tech, or any hybrid can replace years of cognitive engagement with a field or discipline. MOOCing will not change the world, but thinking has and does. What we should be discussing is how we work with information and knowledge to build the capacity of our society to reach the right answers, generation after generation, in order to further the endeavours of mankind. This is why I get angry when thought leaders simply dismiss the industrial model of schooling – without first acknowledging the valuable elements that were there which we need to retrieve. Building upon foundations is a stronger metaphor for me than burning Rome. We wouldn’t be able to do what we can today if it was all bad! Thank you Tim Berners-Lee for putting the human need ahead of your pocket! This is where technology fits in – not BYOD or ipads or pulling down the walls for massive sized classrooms for free play with technology. When technology makes it possible to communicate swiftly, search and acquire information and research effectively, leverage computational thinking, and come up with better ideas or answers – then we are making sense of ICT, e-learning, technology, or whatever you want to call it. MOOCs are just the new water cooler. PLANE and augmented PD initiatives are just the new staff room for peer coaching. Face 2 Face conferences and online gatherings are all great ways to inspire and connect. Augmented reality and virtual worlds are new interfaces for encouraging growth and personal cognitive development. Kids understand this – that’s why they rush into Minecraft! None of them replaces quality and depth in discipline learning.We’re committed to learning. Let’s not pretend that dedicated teaching is lessened by lack of access to technology. 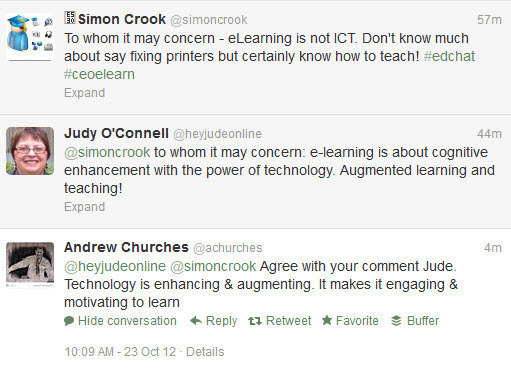 Let’s not pretend that poor teaching is ameliorated by tech. Until I can plug a USB directly into your mind, it’s the cognitive wheels that need to turn. I can inspire you by drawing in the sand, or giving you a book that takes you to new ideas. Or I can give you an App. No more hype for me. Sorry for the rant – this interaction with inspirational friends is what got me thinking! This entry was posted in Learning and Teaching, Teaching, Technology and Software and tagged Augmented reality, Cognition, education, learning, MOOC, Socrates, technology, Tim Berners-Lee by Judy O'Connell. Bookmark the permalink. Thinking, your Twitter bait, blog post.